Now that Hurricane Sandy has passed and the News Reporter's Cameras can reveal to us the destruction aftermath in living colour, people now must strategize and calculate the costs of rebuilding. Not just there homes, but also their landscapes and private wildland acreages, if they are so lucky to own them. Even now plans are being made to harvest any downed trees in what are called Salvage Forestry Operations. Whether State or Private Landowners, the opportunity to make some quick CA$H especially in times of shaky economy would seem to make Dollar $ense. But is this the best way to rebuild the wild woodlands across these regions ? How do such policies really effect the future forest resources economy ? Are the conventional methods of U.S. Forest Service restoration techniques going to truly be the best for all concerned when it comes to the complete picture ? What exactly is the best strategy for rehabilitating and restoring a devastated ecosystem ? Would you believe DO NOTHING at all ?????? Hurricane Sandy countless giant trees such as these in this New Jersey Neighbourhood. It's called, rebuild Nature's Way or hitting the Highway! Incredible as these natural or un-natural disasters are which seem to occur on a regular basis in the News Reports these days, it's clear that attempts at working against Nature as opposed to working with Nature can actually have long lasting damaging consequences. I can understand wanting to put back something once beautiful back the way it was. I can understand and relate personally to the feeling of impatience that an imperfect human being has in wanting results NOW as opposed to actually being patient and waiting for natural processes engineered into every ecosystem to do it's work. Especially since there is this nagging feeling that I may feel I'll never see nor experience such pristine old growth scenery again. Let's face it, we all have short life spans and are driven to less than ideal behavior as a result. Cuyamaca State Park in San Diego County is a prime example. I always considered it to be the wild pristine Old Growth Yosemite of Southern California. In that one fatal decision of a single irresponsible individual Hunter, thousands of years of building and development of a breath taking natural resource are gone in less than a week. Of course logic only dictates that there should be a measure of clean up and rebuilding. No one argues that. Yet patience, thinking and pondering a restoration project with a clear level head beforehand and not allowing desperate emotional hurried or rushed responses which cloud judgement are really what is necessary here. Previously I've written about many of the holistic approaches to building or rebuilding various ecosystems and pointed the readers here to much of the very logical research work done by Richard Halsey of the California Chaparral Institute and other publications and studies which made similar conclusions that after fire disasters, it should be a HANDS-OFF approach which is far more effective than rushing to remedy what is considered a bad situation. In fact it has been found that the long practiced land restoration techniques hinder natural rebuilding or actually create newer problems. Take for example these logical conclusions found at the Western Fire Ecology Center website where common sense approaches of HANDS-OFF have been found sufficient for ecosystem recovery. "With respect to the need for management treatments after fires, there is generally no need for urgency, nor is there a universal, ecologically-based need to act at all. By acting quickly,. we run the risk of creating new problems before we solve the old ones. Ecologically speaking, fires do not require a rapid human response. We should not talk about a "fire crisis" but rather of managing the landscape with the anticipation that fire will eventually occur. Given the high degree of variability and high uncertainty about the impacts of post-fire responses, a conservative approach is warranted, particularly on sites susceptible to on-site erosion." And this is a logical conclusion in applying a restraint on the emotional tendency to interfere or force what is believed to be a faster recovery of a once pristine forested ecosystem. Too much interference has been proven to be a hindrance to recovery than of facilitating it. Allow natural recovery and recognize the temporal scales involved with ecosystem development. Human intervention should not be permitted unless and until it is determined that natural recovery processes are not occurring. 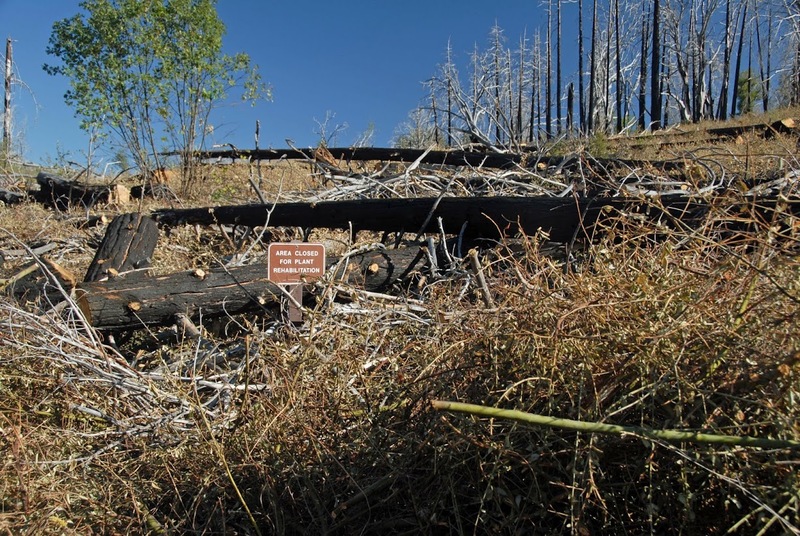 "Human intervention on the post-fire landscape may substantially or completely delay recovery, remove the elements of recovery, or accentuate the damage. Many such adverse consequences are difficult or impossible to predict or foresee in specific situations. In this light there is little reason to believe that post-,fire salvage logging has any positive ecological benefits, particularly for aquatic ecosystems. There is considerable evidence that persistent, significant adverse environmental impacts are likely to result from salvage logging, based on many past cases of salvage projects, plus our growing knowledge of ecosystem functions and land-aquatic linkages. These impacts include soil compaction and erosion, loss of habitat for cavity nesting species, loss of structurally and functionally important large woody debris." Well there you have it. Clearly land clearing of debris hinders growth and development. Removal of various components also creates a void in wildlife habitat by the absence of cavity nesting sites and early recovery vegetation which provides not only cover, but valuable food sources for both trees and animals. Often times this obsession with what are considered valuable tree species to the biased human eye are nothing more than "eye appeal" in the emotional minds of misguided researchers. There is more to the life and health of any ecosystem than mere vegetation. 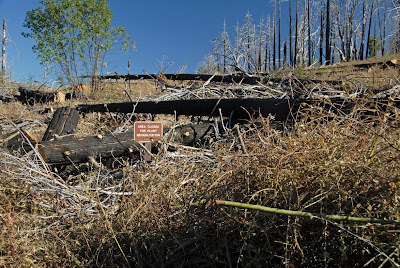 Richard Halsey recently pointed this out on his review of the present ongoing failed recovery policies of the Rancho Cuyamaca State Park in San Diego County. Here is a look at his Google+ Account Photo Gallery and I'll reference just three of his photos for reference on the flawed mindset of those in charge of land management who should know better. Click on each photo and read the accompanying text for the explanation. 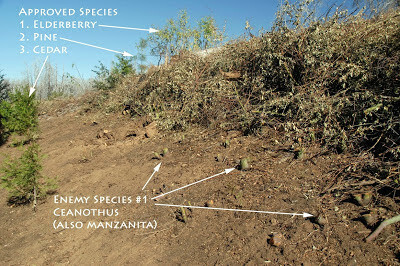 This is a photograph of the cut fire line which attempts to eliminate unwanted species which are considered an "eye sore" and save what are considered valuable species for no other logical reason than they look prettier than Ceanothus, Redshank, or other chaparral which in reality make later succession of the desired species possible. This method above actually can set things back decades. On another observational note: Who in the world believes Manzanitas to be undesirable ???? = Nonsense !!! Notice the warning sign ? Plant Rehabilitation ? "Piles of cut snags (dead trees) that would have provided important habitat, ceanothus, and manzanita. In an attempt to alter the natural post-fire recovery occurring after the 2003 Cedar Fire, park managers (influenced by the same folks at San Diego County's Department of Planning and Land Use who wanted to clear-cut thousands of acres of chaparral in the backcountry) are currently using heavy machinery to remove ceanothus, manzanita, and habitat rich snags (dead trees) from large areas of the park. This will be followed up by a questionable tree planting effort funded mostly by private corporations to acquire carbon credits." 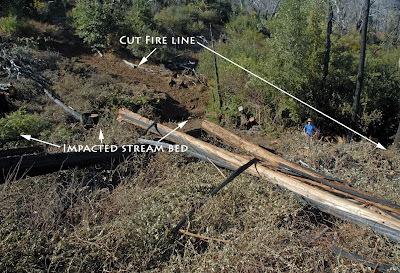 "Despite being warned by a park field botanist to not disturb this fragile riparian area, this stream bed was heavily impacted by equipment and cut debris." In newscasts after intense wind and ice storms, damaged trees stand out: snapped limbs, uprooted trunks, entire forests blown nearly flat. In a storm's wake, landowners, municipalities and state agencies are faced with important financial and environmental decisions. A study by Harvard University researchers, supported by the National Science Foundation (NSF) and published in the journalEcology, yields a surprising result: when it comes to the health of forests, native plants and wildlife, the best management decision may be to do nothing. Salvage logging is a common response to modern storm events in large woodlands. Acres of downed, leaning and broken trees are cut and hauled away. Landowners and towns financially recoup with a sale of the damaged timber. But in a salvaged woodland landscape, the forest's original growth and biodiversity, on which many animals and ecological processes depend, is stripped away. 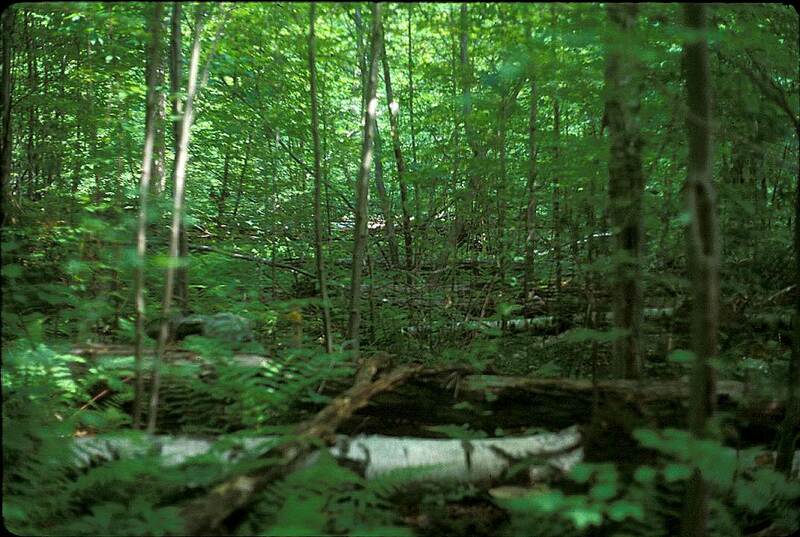 A thickly growing, early-successional forest made up of a few light-loving tree species develops in its place. But what happens when wind-blown forests are left to their own devices? The Ecology paper reports results of a 20-year study at NSF's Harvard Forest Long-Term Ecological Research (LTER) site in Massachusetts. Harvard Forest is one of 26 such NSF LTER sites around the world in ecosystems from coral reefs to deserts, grasslands to the polar regions. "To manage sustainable ecosystems, we must understand how they recover from extreme, natural events, such as hurricanes, fires and floods," says Matt Kane, a program director at NSF for LTER. "This process can take decades. The NSF LTER program is uniquely able to support important experiments at the time scales needed." Eighty percent of the trees were flattened with a large winch and cable. Half the trees died within three years, and the scientists left the dead and damaged wood on the ground. In the 20 years since, the researchers have monitored everything from soil chemistry to the density of leaves on the trees. What they found is a remarkable story of recovery. 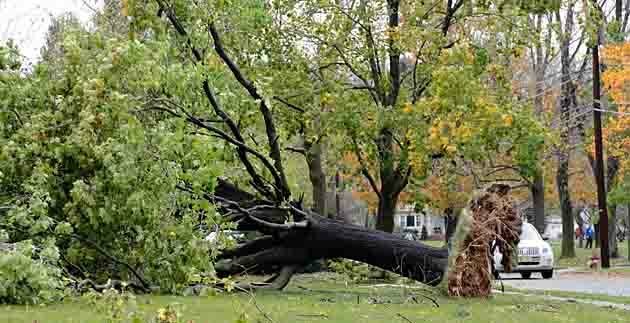 Initially, the site was a nearly impassable jumble of downed trees. But surviving, sprouting trees, along with many new seedlings of black birch and red maple--species original to the forest--thrived amid the dead wood. Although weedy invasive plants initially tried to colonize the area, few persisted for long. 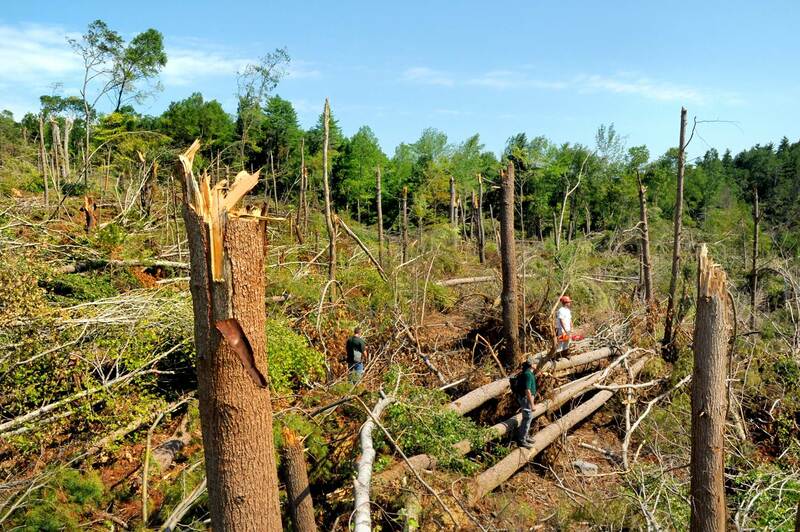 "Leaving a damaged forest intact means the original conditions recover more readily," says David Foster, co-author of the paper and director of the NSF Harvard Forest LTER site. "Forests have been recovering from natural processes like windstorms, fire and ice for millions of years. What appears to us as devastation is actually, to a forest, a natural and important state of affairs." After severe tornadoes in Massachusetts in June 2011, the Commonwealth of Massachusetts' Division of Fisheries and Wildlife pursued a watch-and-wait policy at a site in Southbridge, Mass. There, salvage work is limited to providing access routes for public safety. The area is quickly regaining lush, native vegetation. It supports everything from invertebrates to salamanders, and black bears that winter in thick brush piles and forage for insects in rotting logs. While a range of economic, public safety and aesthetic reasons seems to compel landowners to salvage storm-damaged trees, paper co-author Audrey Barker-Plotkin of the Harvard Forest site suggests that improving forest health should not be one of them. "Although a blown-down forest appears chaotic," she says, "it is functioning as a forest and doesn't need us to clean it up." Now here's an illustrated view of what they did and the results and conclusions from observations. Once again, even a child gets this! 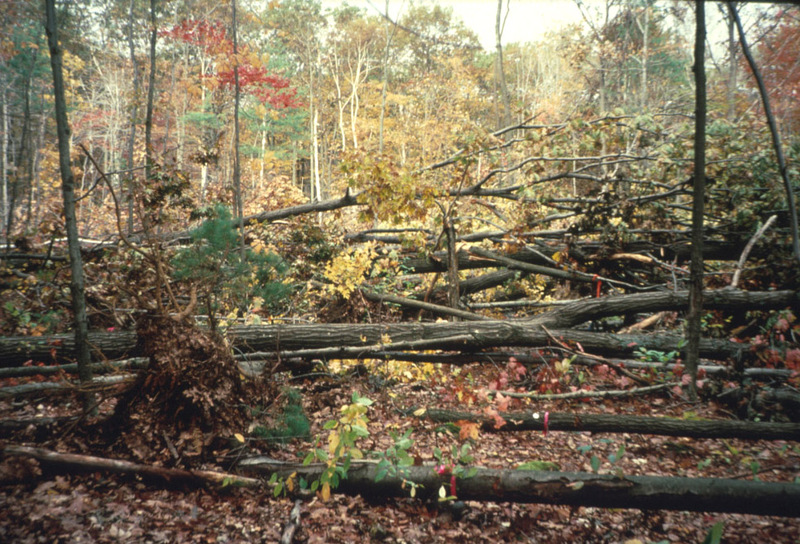 In 1990, this was part of the National Science Foundation's Harvard Forest Long Term Ecological Research (LTER) site was a jumble of downed trees. Here at Harvard Forest in 1990, a team of real Scientists (could have even been done by Mayfield Elementary School kids with Theodore Cleaver [The Beav] led by Miss Landers) recreated a major Hurricane aftermath scenario in a two acre patch of oak forest. Eighty percent of the trees were flattened with a large winch and cable. Half the trees died within three years, and the scientists left the dead wood and damaged trees on the ground. Initially the site was impassable jumble of downed trees. 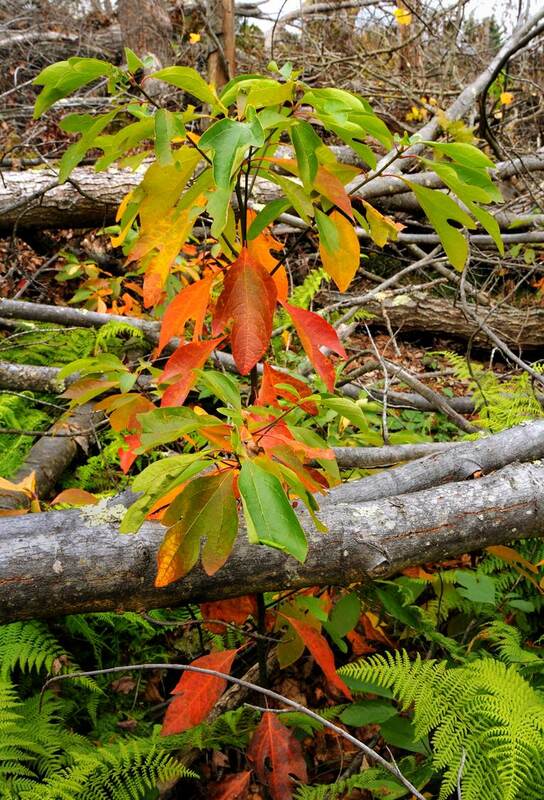 But later Sassafras comes to life after significant storm damage. Other surviving and sprouting trees, along with many new seedlings of Black Birch and Red Maple which were original species of the forest thrived amid the dead wood. In the 20 years since researchers have monitored everything from soil chemistry to the density of leaves on the trees. 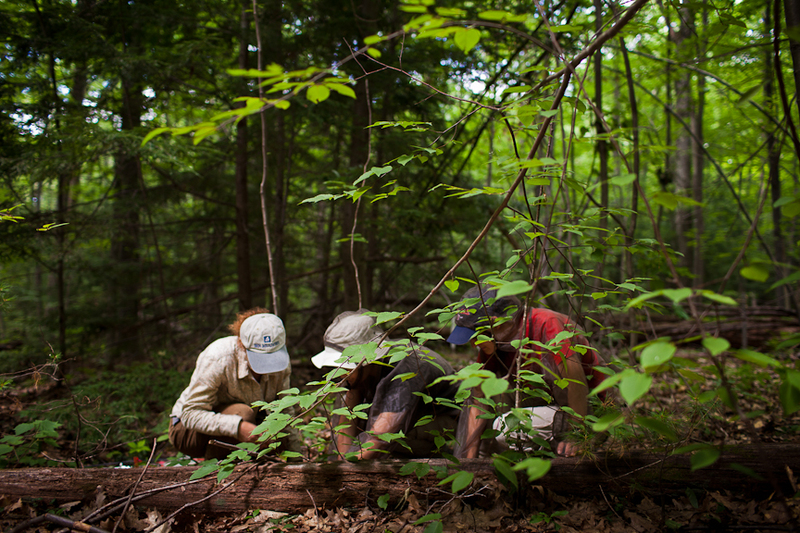 Here above are Harvard Forest ecologists monitoring downed wood in the Hurricane Recreation experiment. Look at this photograph and it's same exact location as the one at the top. Notice that even nine years into the Harvard Forest Hurricane Re-Creation Experiment, trees were everywhere. The area quickly regain it's natural vegetative state quite quickly. Aside from the return of the forest, the other important components of a living ecosystem like Salamanders to black bears were benefited from the left debris which offered over wintering brush piles and foraging opportunities of insects in fallen rotting logs. No doubt even cavity nesting birds found left over snags prime habitat for nest locations. An actual example of broken and snapped off trees in a Tornado impact area in Southbridge, Masschusettes, in 2011. So the Hurricane Re-Creation Experiment was an exact prime example of the reality so common after such catastrophic events such as severe weather damage or fire storm damage. The questions here by readers should be - "Why with all this research and understanding do failed restoration policies and techniques which result in mismanagement and land abuses and other degradation still persist to this day ?" or how about "What valuable habitat restoration concepts based on how Nature really works do I personally come away with and how can such techniques be incorporated into my Home Gardening, Urban Landscape or Large Agricultural Project ?" I'll say it once again, this is not Rocket Science. Even a Child gets it!! !